Hillsboro Airport Runway — Goodfellow Bros. The Hillsboro Airport is the second busiest airport in Oregon (second only to the Portland International Airport) and is home to the corporate jets of Intel, Nike and Columbia Sportswear, to name a few, as well as numerous smaller aircraft. It is also one of the largest helicopter training schools in the nation. 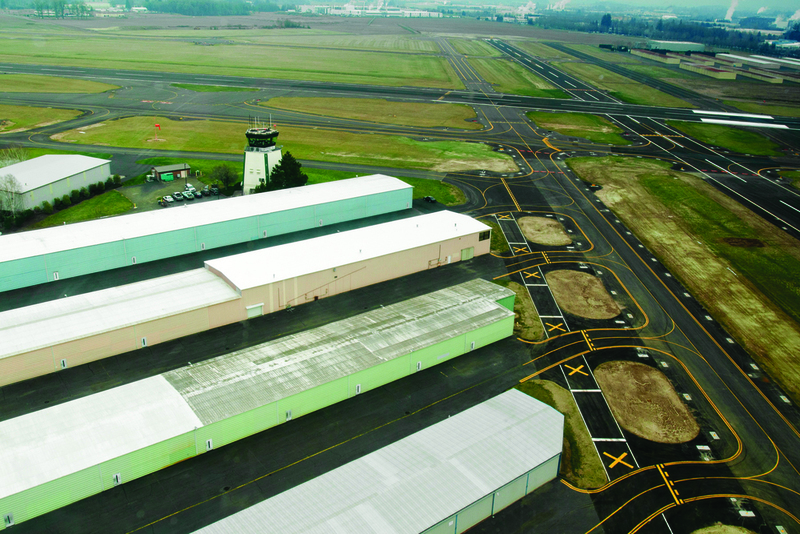 The Hillsboro Airport Runway 2-20 & Taxiway C Rehabilitation project involved the complete removal and replacement of the existing 2-20 Runway, new construction of Taxiway C in a newly aligned configuration, and the construction of multiple connector taxiways. Per the contract, Goodfellow Bros., Inc. rotated four crews working alternating 12 hour shifts, to complete the entire removal, asphalt milling, reconstruction, asphalt paving, new lighting, striping and hydro seeding of the intersection, starting Friday night at 10:00 pm. The runways were then successfully reopened for aircraft use by Monday morning at 5:00 am.